I give away a book. Want a free book? Well, I have a free book and I intend to give it away. Chuck Wendig is the editor. 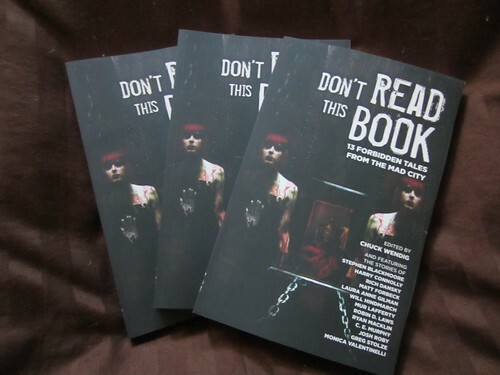 The stories are set in the nightmare world (literally) of the Don’t Rest Your Head rpg. Oh look! A picture of the books! Anyway, if you want to be entered for a chance to win one, sign up for my newsletter by Friday. At that time, I’ll send an incredibly easy question to everyone on the list, and will randomly choose a winner from the responses. Yes, this is a naked attempt to get people to sign up for my newsletter. Hey, I hope to have even more new books out soon, and I figure that anyone interested in this anthology would want to hear about them, too. Of course, after the drawing you can ask to be taken off the list again. Also, due to the costs of international shipping, this is going to have to be U.S. only. You have until late Friday to sign up. Free book!